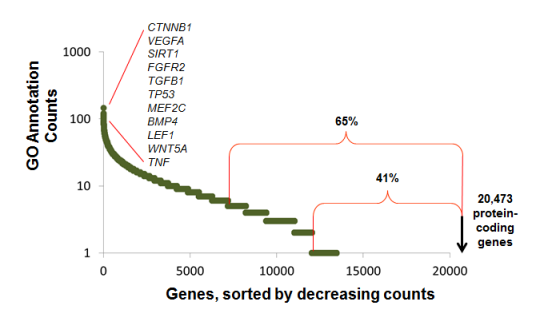 This figure shows that while there are few genes that are very well annotated (100s of GO annotations manually annotated by biocurators), that degree of annotation falls off very quickly. At the time I last did the analysis, 65% of genes had 5 or fewer GO annotations, and 41% had one or zero GO annotations. So the first line says that beta-catenin (with Entrez Gene ID: 1499) had 149 unique GO annotations.